Channel Islands National Park encompasses five islands and one mile of surrounding ocean, off the coast of Santa Barbara in Southern California. These remote islands protect unique habitat and marine life, some found nowhere else on earth. They range in size from tiny Santa Barbara Island (644 acres) to the largest, Santa Cruz (61,972 acres). Each one is unique; some with steep cliffs and sea caves; others with rolling green hills and spectacular views. Each one is also home to a wide diversity of plants and sea life. 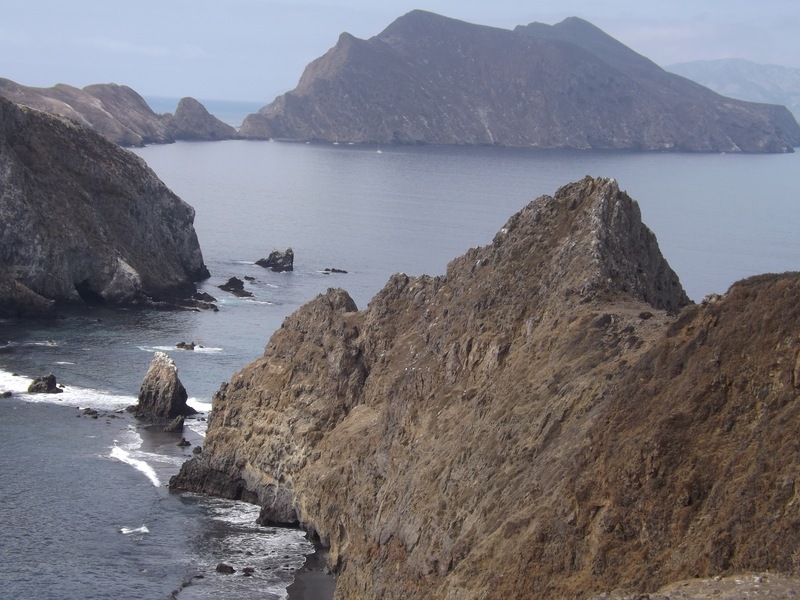 San Miguel Island has a large population of Northern Elephant Seals and Anacapa Island is the largest brown pelican rookery in the United States. Once listed as an endangered species, they have recovered thanks to protection. 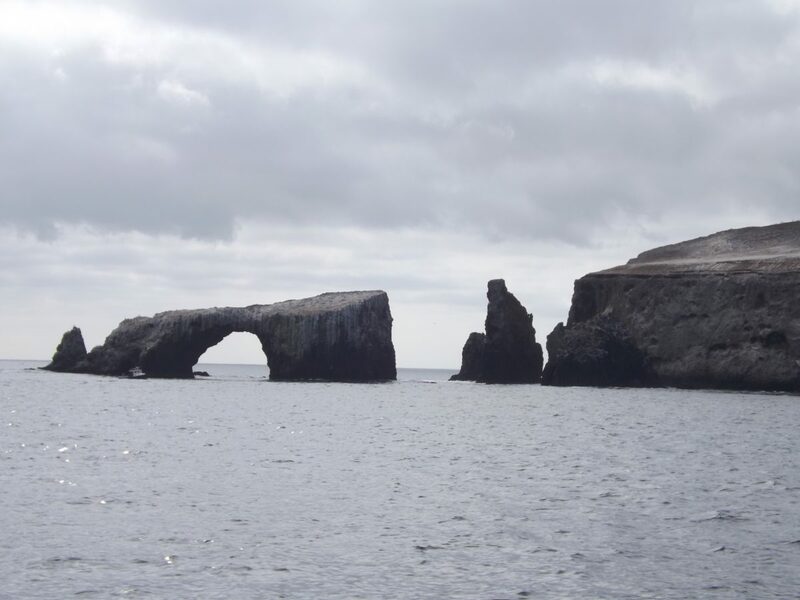 Now when you visit Anacapa, there are months when parts of the island are closed to protect their nests. The main visitor center for Channel Islands National Park is in Ventura. There you can see a movie and exhibits, learn more about the islands and their history, and see a marine life and plant exhibit. The ranger there can also tell you more about how you might visit the islands and what there is to do during your visit. Note that there is an other small visitor center in Santa Barbara, at the Santa Barbara Maritime Museum. There are only two ways to get to the Islands … by plane or boat. You can charter a small plane from Camarillo, but for most folks, this might be a bit on the pricey side. And of course, if you are fortunate enough to have your own boat, the Channel Islands are a great destination! Most people visit the Channel Islands by tour boat. 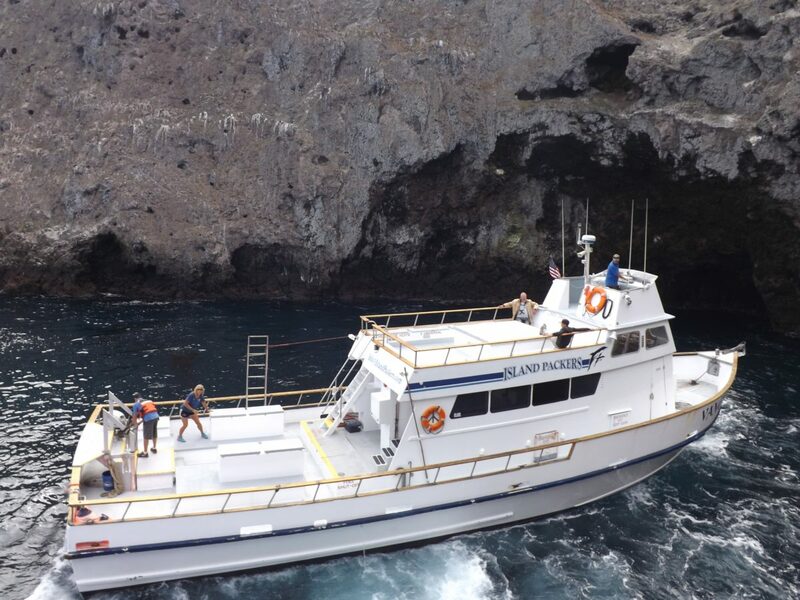 The National Park Service works with a concessionaire, Island Packers, to offer transportation to each of the islands. Some of these operate year-round; others run only during spring/summer months. Reservations are required. Depending on the island you want to visit, the channel crossing can take as long as 2 to 3 hours, but during most trips you will see an abundance of sea life. We saw dolphins and whales, plus a ton of seabirds. Once you arrive on your chosen island, the only way to get around is on foot. Each island has established hiking trails and some offer ranger-led nature walks. (They will tell you all about this when you book your boat trip.) There are also opportunities to book kayaking excursions or rent a kayak so you can explore. The islands offer some of the best scuba diving in the area. Unless you have your own boat, you will need to plan multiple trips if you want to visit each island, or do the island wildlife cruise which takes you along the shore of a couple islands. Be aware that there are no services on the islands and only a couple locations have water. You really need to bring absolutely everything you will need for the duration of your visit. If you want to do more than just a day trip, there are primitive campgrounds on all the islands. Picture being on an island – just you and the sea birds and stars! Amazing! Reservations are required. Each of the islands are slightly different – the outer islands may be windy, you might experience fog, and some have very little shade. Be sure to talk to the rangers about what you can expect before you go. So far, we have only visited Anacapa. 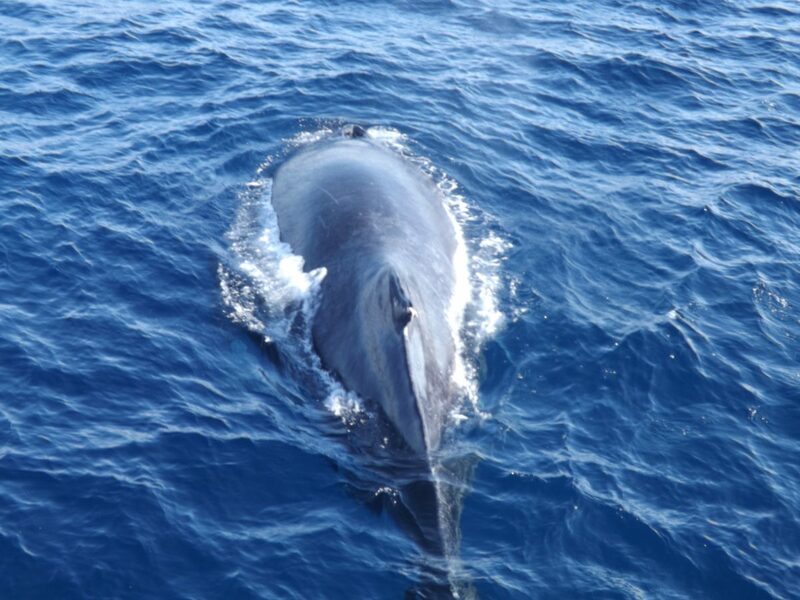 Our boat trip over was better than any whale-watching trip we’ve ever been on! It was amazing. We have a whale go right beneath our boat! The on-board naturalist also really made our trip interesting. Now that whale was close! After making our way up the 153 steps from the boat, we were treated to spectacular views. There are restrooms and picnic areas near the ranger station there. 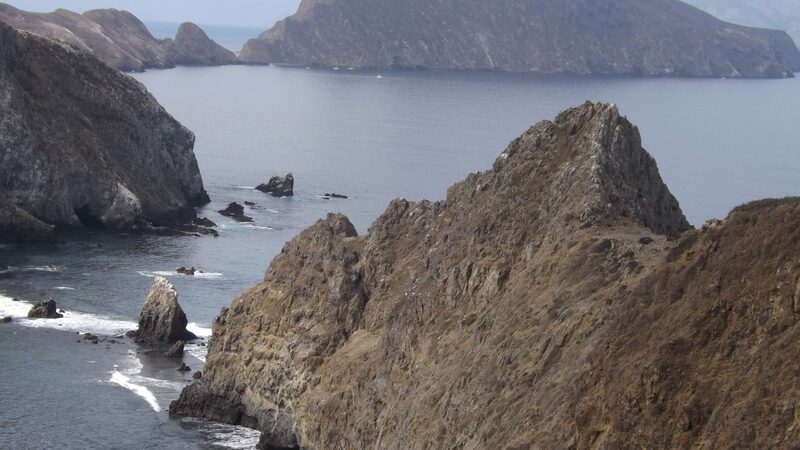 There are only 3 miles of easy trails on Anacapa – the farthest going out to Inspiration Point. From there you can see the rocky ridge of Middle and West Anacapa islands. Gorgeous. You are so remote and it is so quiet, you feel like you are on another planet. You can also walk out to the lighthouse. This was the last one built on the west coast. From there you can see Arch Rock, covered in sea birds and ocean spray. Depending on the seas, this is a fun place to kayak! 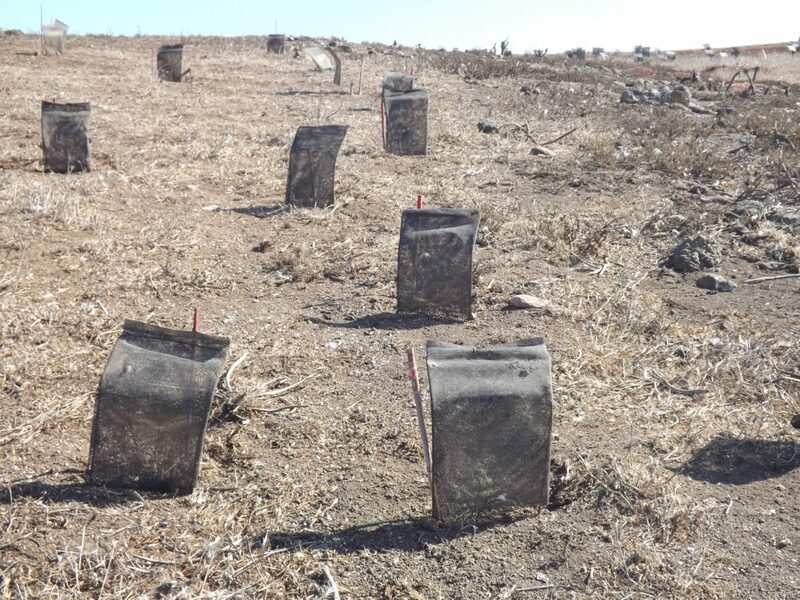 We thought one of the most interesting things on the island was the work that conservation volunteers were doing to re-vegetate. Each of the new plants had a tiny mesh screen above it, there to harvest the fog to water the tiny plant! The islands are so dry, this is a brilliant way to get to every last drop of water. It is amazing to see how creative people can be, and it made us wonder how the original inhabitants and the latter-day farmers managed on these remote, dry islands. There is so much to see and experience, we look forward to continuing our adventures on the Channel Islands … next up, a few nights camping on Santa Cruz. Maybe it is time to plan your visit to this California sanctuary?